Joints are lubricated by synovial fluid, produced by specialized lining cells, called synoviocytes. The cells produce hyaluronic acid as well as other constituents of synovial fluid, including glycosaminoglycans. These proteins impart viscosity to the fluid, which is subjectively assessed as part of synovial fluid analysis. A small volume of synovial fluid can normally be aspirated from joints in all species (up to 1-2 ml can be aspirated from equine joint fluids) and is colorless to light yellow and quite viscous. Analysis of synovial fluid begins at collection, assessing for blood contamination. If the fluid starts off clear and becomes bloody or starts off bloody and then become clears, blood contamination is likely. If the fluid remains bloody throughout collection, there could be intra-articular hemorrhage or blood contamination (smears can be assessed for evidence of prior hemorrhage, see below). 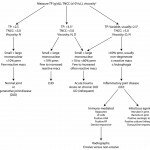 If sufficient fluid is collected, it should be placed in an EDTA anticoagulant-containing or purple top tube (EDTA preserves cell morphologic features and inhibits bacterial growth). A red top or non-anticoagulant tube is not usually indicated, because biochemical analyses are not usually performed on synovial fluids. A culturette is preferred to a non-anticoagulant tube, if culture is anticipated or desired. Sometimes only enough fluid is aspirated to make 2-3 smears. Ideally, these should be “squash” (or better phrased “contact”) smears due to the viscosity. Regardless, direct smears should be made from any fluid and submitted with the EDTA tube. The smears should be rapidly air-dried (with a hair dryer on the highest setting directed to the back of the slide). This is imperative for optimal smear preparation – due to the viscosity, joint fluid dries slowly, the cells do not spread well and can be difficult to impossible to identify, let alone look for informative or diagnostic intracellular structures, such as bacteria or phagocytized nuclear debris. Smears and tubes should be labeled with the patient identification, date, and joint aspirated. A complete history should be provided, with relevant details (e.g. polyarthropathy, single joint, prior surgery, signalment, differential diagnoses, radiographic findings if known, infectious disease titers, etc). Tubes, but not smears, should be refrigerated and submitted on ice packs (with a paper towel between the tube and the pack to prevent freezing of the sample and cells). Smears should be kept at room temperature and all should be shipped in break-proof containers, free of samples in formalin. Note, that if only a small volume of fluid is obtained (<0.2 mL), this should be placed in microtainer tubes versus large EDTA tubes, because EDTA can falsely increase the total protein, as estimated by refractometer. Most laboratories perform nucleated cell counts, red blood cell (RBC) counts, an estimate of viscosity, and cytologic smear assessment. Hyaluronidase can be added to fluids with very high viscosity that gel within the tube (called thixotropism), however this is not routinely done. Gross appearance: The fluid is assessed subjectively for color and turbidity. Nucleated cell count: This is accomplished using an automated particle counter, e.g. Coulter Z counter series, after lysis of RBC with a lytic reagent. Counts can be unreliable due to the viscosity so should be repeated until two consistent counts are obtained. The fluid is too viscous for hemocytometer counts. Note, that the particle counter counts cells or events (e.g. clumps of bacteria will be counted as cells) and does not provide a leukocyte count. Red blood cell count: This is done as above. Usually a total cell count is done first, then RBC are lysed with a lytic reagent and the counts performed again. The difference between the first total cell count and the second count after cell lysis = RBC count. Total protein: This is usually done by a refractometer, due to the viscosity of the fluid. As indicated above, small sample volumes in large amounts of EDTA (e.g. 0.1 ml fluid in a 3 ml EDTA tube) may have falsely high protein concentrations (EDTA contributes to the refractive index [Estepa et al 2006]). Viscosity: This is visually estimated at the degree of “stringiness” of the fluid, i.e. the length of a strand between two objects (we usually take up small amounts of fluid into a 1 ml plastic pipette and draw the fluid in the tip of the pipette slowly away from the lip of the tube, visually estimating the length of the strand or string that forms). A mucin clot test can be done as well, but is no longer performed in our laboratory. Smear assessment: Due to the viscosity, our laboratory only prepares direct or sediment (centrifuged or concentrated) smears of joint fluid. The smear type depends on the total nucleated cell count;sediment smears are made from fluids with counts <20,000/uL, whereas direct smears are made from fluids with higher counts or very bloody fluids. 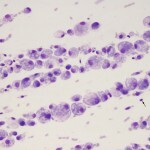 The smears are scanned at low power magnification (10 or 20x) for viscosity (pink to purple stringy background or lining up of cells in the smear, called “windrowing”), chunks of cartilage, multinucleated giant cells (osteoclasts or reactive synoviocytes), aggregates of cells caught up within fibrin (the latter will decrease the total nucleated cell count), distribution of cell types, and the best part of the smear to examine at higher magnification (well spread cells, thinner areas). At higher magnification (50x and 100x), a differential count is generally performed (in samples with sufficient cells), cells are assessed for morphologic features or intracellular structures, and examined for platelets or erythrophages, particularly in bloody smears. Gross appearance: Colorless to light yellow, transparent. May be blood-tinged if blood-contaminated during collection. Nucleated cell counts: This is species-dependent, but counts are usually less than 1,000/uL. Dogs: Counts vary between joints, with higher counts seen in some joints. We generally use 3,000/uL as an upper limit of normal in this species. Cats: One study showed average counts of 161 cells/ul, with a range of 2-1,134/uL in fluids with minimal blood contamination (RBC counts were up to 4,535/uL) (Pacchiana et al 2004). We generally use <1,000/uL as the upper limit of normal. Horses: In most horses, counts are <500/uL, but counts up to 1,350/uL have been reported in healthy horses and we commonly see counts <1,000/uL in research horses here at Cornell University, so we use an upper limit of 1,000/uL as normal. Counts can be higher in equine tendon sheaths (up to 3,500/uL), although we still use 1,000/ul for sheath fluids. Cattle: Similar to horses (Waguespack et al 2002). Llamas and alpacas: Counts range from 100 to 1400 cells/ul. Red blood cell counts: This should be low (<1,000/uL) unless there is blood contamination or hemorrhage (uncommon). In a freshly prepared smear of fluid, erythrophages would support recent hemorrhage into the joint (erythrophagia can be an artifact of storage, e.g. mailed-in samples). Hemosiderophages and hemtoidin crystals can be seen, but are uncommon in joints. Total protein: This is usually <2.5 g/dL, although fluid from normal horses has a protein as low as 1.5 g/dL, so mild increases in protein may be missed with a refractometer. Viscosity: A strand of 2 cm should form between two objects. Decreased viscosity is seen with degenerative joint disease, trauma, inflammatory joint disease, hydroarthrosis, hemarthrosis and hemodilution. Smear assessment: Normal joint fluid is viscous and of low cellularity. Cells are comprised of 50-90% mononuclear cells, of which 80% or more are macrophages or synovial lining cells with <20% lymphocytes. There are usually <10% neutrophils (non-degenerate). Most macrophages are not “activated” – lack cytoplasmic vacuolation, do not demonstrate phagocytic activity and have eccentric round to monocytoid nuclei. Some clinical pathologists use the term “large mononuclear cells” and “small mononuclear cells” demonstrating the difficulty of distinguishing macrophages from synoviocytes and quiescent (non-activated) synoviocytes or macrophages from small lymphocytes. If there are sufficient cells (rarely in a normal joint fluid) or mild blood contamination, the cells will line up in streams in the smear (called “windrowing”), implying normal or retention of viscosity. Unfortunately, synovial fluid analysis rarely is specific for an underlying cause. Thus, the fluid is usually classified as being non-inflammatory (degenerative joint disease or trauma) or inflammatory, based on the nucleated cell count, total protein, viscosity, types of cells and appearance of cells in the fluid (see algorithm). In some fluids, there are unique features that can help with a definitive diagnosis, e.g. 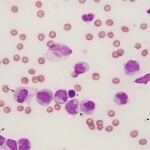 ragocytes, lupus erythematosis (LE) cells, morulae of granulocytic Anaplasma or Ehrlichia organisms, but this is uncommon. Blood contamination will falsely increase the total nucleated cell count (blood-associated leukocytes; their contribution will depend on the peripheral leukocyte count), total protein and % of neutrophils and will decrease viscosity. The degree to which blood influences these results is entirely subjective (opinion of clinical pathologist). In a freshly prepared sample, there will be platelets and no evidence of erythrophagia, however peracute hemorrhage can look similar. Thus, examination of the fluid during collection is the best way to assess for overt blood contamination (but will miss microscopic contamination). Erythrophagia does not provide additional information in smears made from stored fluid, because macrophages will phagocytize erythrocytes in the tube in vitro, particularly if activated (this can occur rapidly, within 2 hours, of collection). Hemarthrosis should be suspected if the aspirated fluid resembles blood and the fluid does not clot in a non-anticoagulant tube or there is erythrophagia, hemosiderophages or hematoidin crystals observed in smears of freshly made fluid (note that hematoidin crystals only form in a non-toxic environment). This is uncommon but can be seen secondary to hemostatic disorders, particularly inherited disorders of secondary hemostasis, such as hemophilia A, and anticoagulant rodenticide toxicosis. A coagulation panel is always worthwhile in an animal presenting with hemarthrosis. These can be due to trauma or degenerative joint disease (DJD). 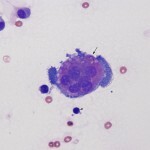 The joint fluid can be normal, but there is usually increased volume (hydroarthrosis) and a mild increase in large total nucleated cell count (usually <5,000/uL) consisting mostly of mononuclear cells (macrophages with some synoviocytes), that may be “activated” (foamy cytoplasm, cytoplasmic vacuolation), decreased viscosity, and a mild increase in total protein (usually <4.0 g/dL). Reactive synoviocytes (bi- or multinucleated, deeper blue cytoplasm than normal, aggregates of synoviocytes) can be seen, supporting underlying synovial hyperplasia. Multinucleated synoviocytes must be differentiated (which can be difficult) from multinucleated osteoclasts, with the latter indicating damage to or erosion of cartilage with exposure of subchondral bone. Osteoclasts generally have pink granular cytoplasm, whereas syniovocytes have deeper blue cytoplasm, which lacks granules, and tend to have fewer nuclei that are centralized within the cell compared to the diffuse distribution of osteoclast nuclei. Cartilage fragments may be seen if there is injury to cartilage, but could also be inadvertently aspirated. In one retrospective study in 130 cattle with different arthritidies (Rohde et al 2000), 8 cattle with DJD had average nucleated cell counts of 219/uL (range, 43-8,500/ul), with an average of 7% neutrophils (range 1-70%, blood contamination not indicated) and 90% mononuclear cells (range, 30-99%). The average total protein was 2.5 g/dL (range 0.3-5.7 g/dl). Exercise does not increase nucleated cell counts or total protein, but does increase synovial fluid volume in horses. This is usually due to an increased proportion of neutrophils (>10%, as long as it is not attributable to blood contamination). Neutrophils are rarely degenerate, even with bacterial sepsis. Total nucleated cell counts and protein are usually high (>5,000/uL and >3.0 g/dL, respectively) but can be within normal limits) and viscosity can be normal or decreased (more often decreased with sepsis than immune-mediated disease). Concurrent hemorrhage may be seen. Immune-mediated disease: Most common cause of inflammatory joint disease in small animals, rare in other species. Diagnostic findings in smears are LE cells and “ragocytes” (Camus et al 2010), but these are rarely seen in joints of affected animals. 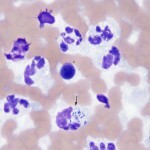 LE cells are neutrophils which contain a large homogenous light purple remnant of nucleus that displaces the neutrophil nucleus to the side of the cells and “ragocytes” is a term used for neutrophils which contain variably sized purple particulate material in their cytoplasm (presumptive nuclear debris or immune complexes of antibodies and histones or DNA). Dogs: In a study of 39 dogs with immune-mediated polyarthritis (Clements et al 2004), nucleated cell counts ranged from 3,700-170,000/ul, with 20-98% neutrophils. Causes include systemic lupus erythematosis (SLE), rheumatoid arthritis, erosive polyarthritis in dogs, vasculitis (e.g. Sharpei fever), juvenile onset polyarthritis of Akitas (counts ranged from 5-620,000/ul and were mostly neutrophils). Some of these polyarthropathies are associated with underlying neoplasia or gastrointestinal disease. Drug reactions, e.g. sulfur drugs, can also yield a delayed type hypersensitivity-based polyarthritis (this can affect particular breeds, such as Dobermans). Antinuclear antibody testing and rheumatoid factor testing is worthwhile in animals with a polyarthritis. Note that infectious agents, such as Lyme disease, is thought to induce a polyarthritis due to deposition of immune complexes (immune-mediated) not via direct joint infection. Cats: Cats suffer from erosive (chronic progressive or periosteal proliferative) and non-erosive polyarthritis. Erosive chronic progressive polyarthritis in cats may be secondary to feline leukemia virus and syncytia forming virus infection. The latter occurs mostly in intact or neutered male cats and is deforming (insidious onset and course). Erosive periosteal proliferative arthritis is of more acute onset and course). Causes of non-erosive polyarthritis (which generally affects distal joints) are SLE, drugs (trimethoprim-sulfonamides), inflammatory disease in various organs (e.g. gastrointestinal tract), neoplasia and idiopathic. Equine: Immune-mediated joint disease is reported rarely as a consequence of bacterial infections (Rhocodoccus, Escherischia coli), typically in foals. A syndrome of idiopathic polysynovitis was reported in adult horses (total nucleated cell count <7,000/uL, total protein <3.6 g/dL and 12-81% neutrophils in the fluid). The horses had infiltrates of plasma cells and lymphocytes in the synovium and responded to immunosuppressive therapy. An LE-like syndrome has been reported in individual horses. Infectious agents: Bacterial arthritis is the most common cause of inflammatory joint disease in horses, camelids and cattle and inflammatory joint disease should be considered septic until proven otherwise in these species. Bacteria: Bacteria usually cause a monoarthritis and this can be a complication of penetrating wounds or surgery. Some bacteria or infections can cause a bacterial polyarthritis, e.g. infective endocarditis in dogs and pigs, Pasteurella and Streptococcus species (erosive polyarthritis) in cats. In a retrospective study of arthritis in 130 cattle (Rohde et al 2000), infectious arthritis was seen in younger cattle (5 months), with an average of 62,880 cells/ul (range, 1,250-385,000/ul), 94% neutrophils (range, 8-99%) and 5% mononuclear cells (range, 0.5-57%) with 5.6 g/dL total protein (range, 0.2-9.0 g/dL). Mycoplasma species and bacterial L forms can induce a polyarthritis in several species, including cats (erosive and non-erosive arthritis) and pigs. Bacteria are rarely seen in fluids and neutrophils are usually non-degenerate, however bacteria are frequently seen in foals with polyarthritis (along with degenerative neutrophils). Studies in horses have shown that culture of a synovial membrane biopsy is not necessarily more sensitive than culture of the fluid in causes of bacterial arthritis. There have been rare reports of Mycoplasma infection causing a non-suppurative synovitis (Barton et al 1985). Viruses: Calicivirus in kittens 6-12 weeks of age can produce an arthritis consisting of clear fluid with macrophages. Feline leukemia virus and feline syncytial forming virus can induce an erosive polyarthritis. Caprine arthritis-encephalitis virus can cause a polyarthritis, that is characterized by high proportions of lymphocytes. 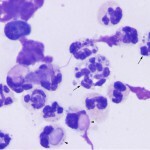 Ehrlichia/Anaplasma: Ehrlichia ewingii in dogs and Anaplasma phagocytophilum are becoming more common causes of polyarthritis in dogs. Morulae may be seen in neutrophils but usually <5% of the cells, so they could be missed on scanning. All dogs with polyarthritis should be tested for these tick-borne diseases and given doxycycline if positive. Trauma: Acute trauma can cause increased nucleated cell counts, with high proportions of neutrophils.According to one 1992 study in dogs with cranial cruciate rupture, nucleated cell counts as high as 12,000/ul (average, 1965/ul) with up to 56% (average, 7%) neutrophils and 4.2 g/dl protein (average, 3.2 g/dl) was seen. In the above retrospective study in 130 cattle with different arthritidies, 26 cattle with traumatic arthritis had average nucleated cell counts of 1,160/ul (range, 10-40,000/ul), with an average of 35% neutrophils (range, 1-71%), 70% mononuclear cells (range, 5-97%) and 3.4 g/dL total protein (range, 1.1-6.5 g/dL). Repeated arthrocentesis with sterile injections of 0.9% saline can induce sterile inflammation (<14,000/ul nucleated cells with <71% neutrophils and <4.5 g/dL protein) for 3-7 days. Sterile synovitis: This occurs in response to intra-articular injections (e.g. corticosteroids, glycosaminoglycans, hyaluronic acid, antibiotics, local anesthetics) in horses. Total nucleated cell counts can be high (>30,000/uL) with >80% neutrophils. This usually resolves within 1-3 days. Similarly, injection of allogeneic or autologous mesenchymal stem cells results in a marked leukocytosis, consisting primarily of neutrophils, in injected joints (in contrast to minimal inflammation in a saline control) 24-48 hours after injection, with inflammation persisting for up to 72 hours after injection. The total protein is also increased. Although blood contamination was also present, the leukocyte counts were too high to attribute to contamination alone (Carrade et al 2010). Eosinophilic synovitis: This rare condition appears immune-mediated in dogs (Christopher and Wallace 1986) and idiopathic in horses. The disorder in horses can be responsive to antibiotics and non-steroidal anti-inflammatory drugs (Climent et al 2007). Eosinophilic inflammation can also occur secondary to intra-articular injection of bacterial antigens (Madison and Ziemer 1993). Lymphocytic synovitis: This has been reported after cranial cruciate rupture (Erne et al 2009) and as part of the syndrome of villonodular synovitis in dogs and horses. In horses, this usually occurs in the fetlock joints and is associated with nodule formation in the dorsal aspect of the joint. It is associated with trauma and mostly occurs in young racehorses. It is characterized by synovial hyperplasia with nodular aggregates of lymphoid cells. The fluid contains between 5-20,000 cells/ul, dominated by small lymphocytes. We have also seen mildly increased total nucleated cell counts with increased proportions of lymphocytes (30-70%, some with red cytoplasmic granules, i.e. cytotoxic T or natural killer cells) after articular injury and insertion of explants in horses. Some dogs with immune-mediated polyarthritis can have a predominantly lymphocytic synovial fluid, but this is rare (personal observations).